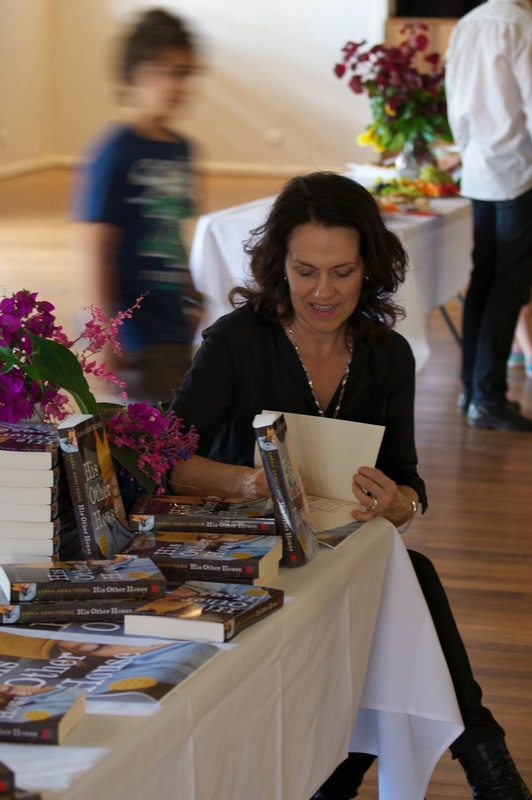 His Other House was launched in early March, by the lovely Marele Day (pictured below). Here’s a (slightly edited for sense) version of what I said at the launch. Books don’t need to be launched. I think that a launch party is really an excuse for the writer to surround themselves with their friends and family. And I really wanted to do that, partly because it’s been a loooong time between books for me, and the publication of this book felt like something really worth celebrating. After Salt Rain came out in 2004, I had an idea it might take me three or four years to write the next one. But lots has happened for me in the years following 2004. I’ll just give you a thumbnail sketch: I got divorced, I met Al (or I should say that I’d known Al for some time but suddenly saw Al in a whole new light), we started trying for baby, ended up doing IVF, had two miscarriages, then – at last! - we got pregnant and had a baby – our beautiful, big, now-nearly five-year old girl Amelia. All of which rather took time away from writing. All of which also ended up feeding my writing. One of the great things about writing fiction is that via your characters you get to explore and dig down into themes and experiences that concern and interest you. In His Other House, one of the characters has been doing IVF and at times (most of the time, actually) contemplates her longing for a child and later, notions of motherhood. At this point I will hasten to say that the character I’m talking about – Marianna – is not me. Fiction writers do this peculiar thing of taking snippets from their own life and their way of seeing the world and giving it to characters – so there’s a bit of me in all the main three characters. But only a bit. I wouldn’t pretend I’m speaking for all writers when I say that. Al, for instance, writes about his own life, even when writing ‘fiction’. There is something about that process of creating a fictional character that feels really quite magical to me. A character is built slowly, layer by layer. In early drafts my characters appear – I confess - really pretty thin and mono-dimensional and sometimes a bit stereotypical, despite my best intentions. It takes time to tease out how they look and their little habits and quirks, the contradictory aspects of their personality. That construction of character is partly an intuitive process - just following my pen and not thinking about it too much - and partly it’s a very conscious, even analytical process. At a certain point I have to work out how characters need to be to best serve the story. Sometimes I write little conversations with myself in middle of the manuscript (which could appear quite wacky to someone else reading it). For instance, I might write: How does this character move the plot forward in this scene? What’s her function? And sometimes the answer is this: this character has NO function in the story. You can only hope that you realise something this early in the rewriting process. Sadly – in His Other House – I persisted for a long time with a character who wasn’t quite working. Then I got some feedback that questioned how well she was woven into the story. I had to look at her and saw that she did indeed need to be more integrated into the story. I tried and tried to make it work. I spent hours nutting it out and in the end, had to kill her off, which was painful. Painful because I get attached to my characters – she was real in my mind – but mostly painful because of the amount of work involved. Killing off a character means lots of tidying up. She may not have been woven in well enough but she was woven in well enough to create lots of work extracting references to her, and I ended up ditching whole chapters that revolved around her and had to come up with something else to fill the gap. You really hope that your rewrites don’t involve all the work of knocking off a character or adding another one (which is more or less what I had to do to fill the hole left behind by character I killed) but sometimes it just does. Sometimes you have to bite the bullet and make big changes – change the structure or an aspect of plot or a setting. For instance I had to change a location in the story…. It’s set partly in Brisbane and partly in a town called Corimbi – which, I must say, is remarkably like Mullumbimby. Originally I didn’t have it set partly in Brisbane but Brisbane served the plot better. And now I’m wondering if I should be telling you this if I want you to suspend disbelief when you read the story. Maybe I’m showing too much of the workings behind the scenes. You know, I want you to read it and feel like it could never have been another way, that it’s REAL. And that’s the conceit isn’t it? I want you to really feel for these characters – the way I feel for them – but they have just come out of my head (and my heart I hope). When we read a novel, we know that it’s made up, but something about a well written novel brings the made-up characters to life, perhaps because novels offer us that thing that’s sadly impossible in real life: the chance to get inside someone else’s head, to feel what they feel, understand why they make the decisions they make. I think reading and writing offer us the chance to develop greater insight into ourselves and greater compassion for other people. It’s impossible – as a writer – to create a fully formed character without getting under their skin and understanding their perspective. In this book I set out to write about someone who behaves badly – but I also wanted to create in him a character who the reader might be able to feel empathy for, or at least understanding. Some of you may empathise with him, some of you may not, and to my mind that’s one of the joys of reading novels, that we each bring our own experience to the book. Each time someone reads a book, they have a unique relationship with that story and those characters. I love that idea. It thrills me that the story I have written is not static, not fixed; it goes out into the world and is effectively a different story for each person. One of the things that I really wanted to explore was the question of honesty. How honest do we need to be in our relationship. Is absolute or even radical honesty the best? I wanted to look at what it takes to be a good partner and a good parent. All these questions are - of course - questions that I ask myself, and this novel represents my concerns, my sensibilities and my questions about life. Finally, it’s a solitary business and writers need a community around them, and writers need readers. So thank you for being friends and part of my community and thank you for being readers of books.